Breeders are quietly optimistic that they can develop a modern animal for the profitable sheep-fat market, while Persians are increasingly being used to breed fat and fertility back into Dorpers, writes Roelof Bezuidenhout. A flock of Blackhead Persians in the Karoo, where farmers claim they do better than Dorpers. 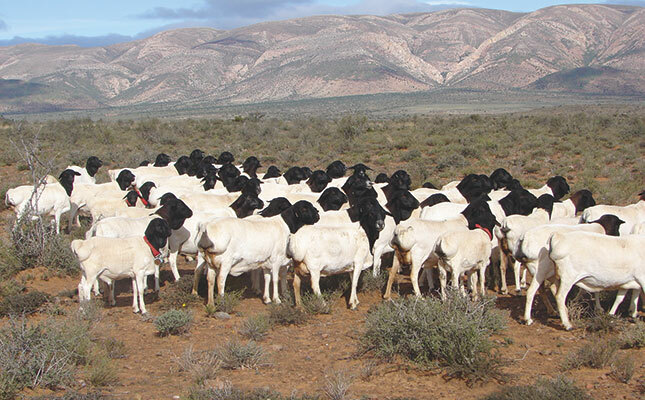 The recent National Persian Sheep Championship held in Willowmore in the southeastern Karoo drew 380 entries, nearly 200 more than the previous event in 2009. There was also a strong contingent of flock sheep, indicating that this light-framed, fat-rumped breed is staging a comeback after at least 70 years in the wilderness, having been ousted by the Merino, a few imported English mutton breeds and several synthetic breeds. The Persian is not expected to compete with modern breeds for a place on the farm in the commercial mutton market, but it can bring in handy money – particularly during the hunting season when its uniquely flavoured, oily rump fat is a highly sought-after ingredient for dry game sausage. The swing to leaner carcasses – dating back to even before the Second World War – has caused an acute shortage of sheep fat, which can go as high as R50/kg. In winter this makes a Persian worth a good R1 200. But the sheep sell out of hand, generally for R16/kg to R17/kg on the hoof, as there’s no market for them at the abattoir. The Persian is a hardy, easy-care breed, capable of walking long distances on its gazelle-like legs with remarkably little water. It once had a reputation of being heavy on veld, probably because farmers tended to overstock heavily during the pioneering days. In reality, its liveweight indicates that one can stock about 1,3 Persians for every conventional mutton sheep. But Kobus Lötter, president of the Blackhead Persian Breeders’ Society of South Africa ,warns that it’s risky to take the easy-care concept too far. “Although it needs less care under extensive conditions than many other breeds, you still have to manage the Persian the same way you would other sheep to maximise economic return. Predator control is vital,” he says. The society was formed in 1937 but became inactive during the war, and started up again in 1948. By then the Dorper, a synthetic breed bred from the Blackhead Persian and Dorset Horn, was well on the way to becoming the main mutton breed. 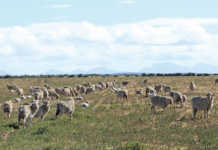 There are about 8 000 Persian stud ewes in the country today and commercial flocks range from 30 to 50 ewes per farm in the Eastern Cape’s ‘kudu belt’ to a few thousand in the more arid Northern Cape, where some farmers say Persians do better than Dorpers. Some Dorper breeders occasionally put Persian rams back onto their ewes to regain lost fertility and fat. 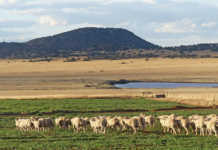 Kalahari farmers also use Persian rams on Dorper ewes for a smaller but faster-growing winter lamb. Kobus, who farms at Doornpoort, Willowmore, says because the Persian sheep industry has become so small the immediate challenge is to ensure the survival of the society and increase its membership. “We’re not trying to convince farmers to switch to Persians; we’d merely like those who already have Persians to improve their flock so they can make more profit and make more breeding material available,” he explains. The Persian Society’s emblem is based on a photo of a big ram under a thorn tree, specially posed outside Hopetown in 1983. The effort that went into creating it, in the days before digital photography, shows just how dedicated the Persian fraternity is. For the past three years the society has been hosting judging courses and information days to promote the modern Persian as “drier”, with less body fat and far better fat distribution. The fat is localised around the rump, because if the tail hangs too low it causes mating problems and urine burn. 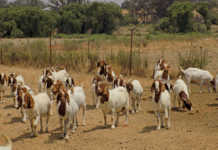 Kobus expects Persian numbers to increase as farmers learn more about them. “They’re ideal low-maintenance sheep for small-scale and smallholder farmers. They’re docile, easy to manage and don’t creep under or jump fences. “You get Blackheads, Redheads, Black Painted and Red Painted types,” he says. The black and red colours are from one of the original imported ewes, which produced one Redhead and one Blackhead lamb. Painted varieties can be obtained from breeding Blackhead and Redhead rams to mono-colour Afrikaner ewes, and the beautiful hides add value. Hides usually grade as Cape Glover, irrespective of age. Because each type is colour-specific, breed standards are strict about colour distribution and spots. Contact Kobus Lötter on 044 956 1009 or 082 432 293 or e-mail Riana Spamer at [email protected].